Washington DC has a new restaurant group in town that really likes presidents, at least the dead ones. 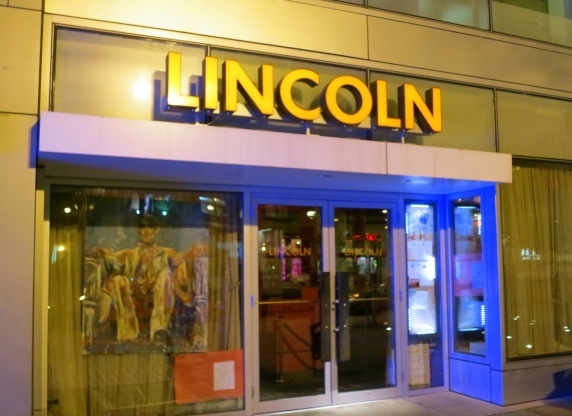 Alan Popovsky, who did his share of restauranting prior to Lincoln, opened Lincoln in 2011 and followed it with Teddy and the Bully Bar. Rumor is he’s reviving another dead president as restaurant…maybe JFK or Thomas Jefferson, although I can’t find anything in the restaurant rags since Teddy and the Bully Bar opened. Maybe two presidents are enough to keep him busy. We visited Lincoln while in DC this summer and while the food didn’t knock my socks off, the artisitic design was a party for my eyes. The artist Maggie O’Neill pulled it off with some pretty creative concepting that keeps the place fun and light….no deep thinking required. There are pennies on the floor, pennies tufting the big chair that mimics the chair at the Lincoln Memorial, pennies on the wall in the shape of the DC flag, glass jars hanging from the ceiling (the story goes that union soldiers ate from glass jars during the Civil War), the Emancipation Proclamation emblazoned on one wall backlit by color changing LEDs (that thankfully don’t rotate). a textured Jasper Johns’ flag on one wall, paintings of Lincoln. And the servers wear t-shirts with Lincoln quotations. Our server was wearing a most apropros quote: Avoid popularity if you would have peace. And I want to give not just a nod but a deep bow to Lincoln’s restrooms….they are awesome. Deliberate and detailed and definitely in keeping with the design of the restaurant. Both Abe’s room and Mary’s room are covered in custom murals. Mary’s lean toward the pretty socialite, Abe’s toward men and their tools. Use your imagination. The bar program makes use of house infused liquors, so there is a ‘library/infusing room’ for just this purpose. Quotations a la Abe himself are reminders down the mirrored back hallway. There is not a breath of this place that hasn’t been thought through from an aesthetic and artistic perspective. Hopefully the operation was given as much attention as the artistry….from the customer perspective, definitely fun.